Shortly after we got married Mr. Debutant and I inherited a dining room table and 2 chairs from his parents. Mind you this table had been theirs for years and years. Mr. Debutant has years of memories of home cooked meals at this table. I really have no idea how old the table was when we got it, at least 10 years old but I think it was closer to 15-20 (I'll have to ask him later.) Needless to say that while the table was sturdy it was lacking in visual appeal. Mr. Debutant comes from a family of 4 kids, needless to say they took their toll on the table. So one day about 4 years ago I decided to do something about it, and as it goes with all of my major projects I did it without consulting my husband. My theory behind this is as follows: If I ask or mention that I intend to do something to any piece of furniture that is solid, or solid wood for that matter, Mr. Debutant tends to get all negative on me. He thinks I'll ruin a sturdy item, never mind that it looks like it's been through a garbage disposal. If it's sturdy and solid wood, you don't mess with it. he just doesn't catch my vision. So I've learned to just do my own thing, preferably when he is out of town so he won't interrupt until he sees the final product. 1) Do what you like to the base and side edge of the table top, sand paint etc. Don't worry about refinishing the actual top. My table was in decent shape in these areas so I only darkened the wood with a stain. 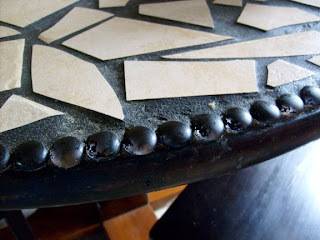 3) Once dry glue all your gems (using mosaic glue) to the outer edge of the table top. 4) Break up your floor tiles into pieces ( I left fairly large pieces) You can do this by placing the tile between 2 rags so little pieces don't go flying all over, and then take a couple of good whacks with a hammer. 5) After you've vented all your frustrations on your tile, put the hammer down and step away from the hammer. 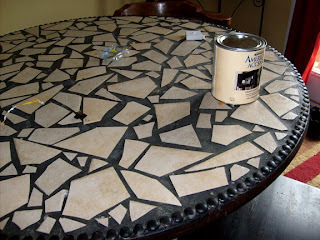 7)Once dry mix up your grout (I used black) and apply to the table top just as you would a floor. Clean up the excess. For this step follow the manufacturers directions. I must admit I never got to step 8. 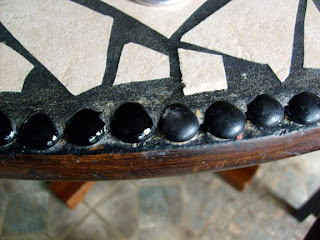 And my table has done great, with the exception of the little glass marbles. So this last week I went back and re-painted the marbles by hand using a little brush and some black paint.